Mr. Buhari said he intends to sign the agreement, reached by African leaders at a summit in Rwanda in March, soon. “In trying to guarantee employment, goods and services in our country, we have to be careful with agreements that will compete, maybe successfully, against our upcoming industries,” Mr. Buhari said at a news conference on Wednesday, Reuters news agency reports. 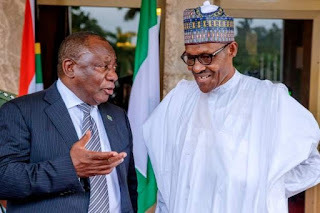 Mr. Buhari was speaking during a visit to Nigeria by South Africa's President Cyril Ramaphosa. Mr. Ramaphosa had earlier told Nigerian business leaders that South Africa saw huge benefits from the continental free trade deal and that a draft agreement relating to the movement of people was being reviewed. This was Mr. Ramaphosa's first visit to Nigeria since he became president in February.